1,244 sq ft; lot: 6970 sq ft - MLS# 2992932 Courtesy of The Venuti Group Inc.
You'll love living here! 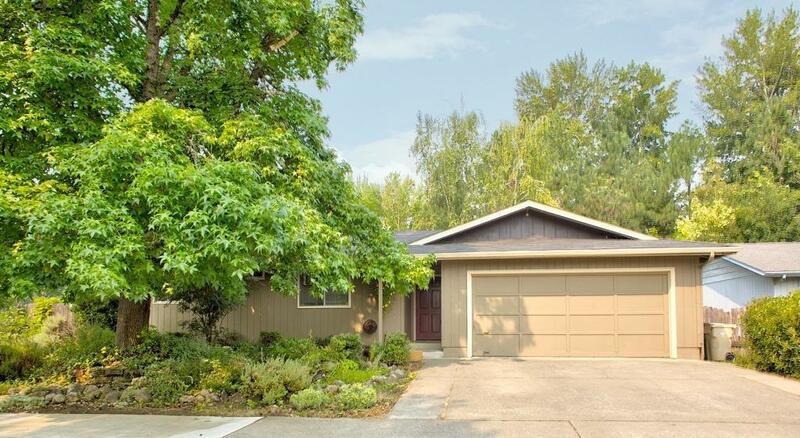 Bright & open, this single story, contemporary home is in a great neighborhood close to town & the Reinhart Volunteer Park (also known as the All Sports Park) with its trails, ponds, & facilities adjoining the Rogue River! Built in 1987 with three bedrooms & two bathrooms, this clean & move-in ready home features a spacious living area with vaulted ceilings & plenty of natural light with large windows overlooking the backyard. Functional kitchen highlighted by stainless steel appliances & a dining area with doors to the covered back patio & lush green lawns make this the ideal spot for Summer BBQ's & family get-togethers! Master bedroom includes ensuite bath with walk-in shower & large closet. Two additional bedrooms, guest bathroom, laundry room, & two car garage with extra storage space complete the home! Low maintenance landscaping front & back plus beautiful shade trees, garden area, in ground sprinklers & more. Could this be your new home? Directions: SW Bridge to SW Cottonwood st.